Which Smoker is Right for You? What to Look for When Browsing for Smokers? When it comes to smokers, one of our favorite brands is Masterbuilt – because, who hasn’t heard of them, right? We at Grills Forever have been trying out some of their different types of smokers over the past eight years, and we all agree that their smokers are really impressive in terms of build quality and features. Every model has different features that definitely appeal to all kinds of buyers out there. Plus, cooking with these smokers always deliver mouthwatering results! 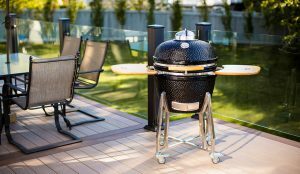 However, after intensive deliberation, our team unanimously chose the Masterbuilt 20075315 Smoker as our top pick among their models. It’s a digital smoker that makes using it very convenient and time-saving with its large cooking area. Plus, you can chill out with a beer while waiting for your food to get done, it’s that easy to use! This smoker is super super big! It boasts some really awesome digital controls and remote controls, which mean you can chill and know this smoker will do the job well. 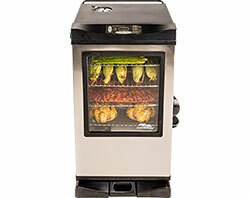 This 40 inch digital electric smoker literally lets you cook up a feast in a breeze. You can invite all your family and friends – its huge cooking area of 975 square inches lets you easily cook for everyone! Just to give you an idea, you can put in 12 whole chickens at once. Simply plug it into an outlet, set the time and temperature and let it do the work. Maximum temperature is at 475 degrees Fahrenheit, so it’s versatile and can be used for grilling, smoking, roasting, barbecuing or baking. Another plus feature is its viewing window that lets you check what’s cooking inside without having to open the door and saving energy in the process. For $280, all its special features makes it worth every penny. 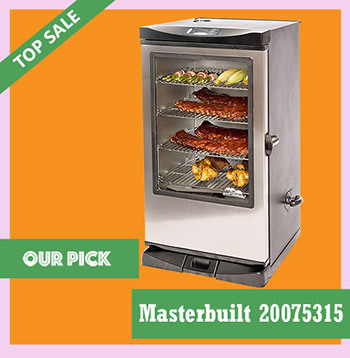 Choose this smoker if you want some great features for your money. It has a really large capacity, separate for and windows, so you can keep watching your food while it cooks. This propane gas smoker tops all other gas smokers from Masterbuilt. First off, it has the largest cooking space in our list of top Masterbuilt smokers at 2000 square inches. It’s large enough to cook for an entire neighborhood in the great outdoors! This smoker operates with two 8250 BTU stainless steel burners. Special features include a push-button ignition, porcelain-coated wood chip tray and water pan, a thermostat, and viewing window through which you can check what’s cooking without letting heat escape. It also has a separate door for the wood chips, and a fully-insulated cooking chamber, all adding to its cooking efficiency. Its maximum temperature is 350 degrees Fahrenheit. This smoker is really affordable. You can read a great all in one smoking experience with this bullet style smoker. Low cost means small capacity, but it is really portable. Buy it from Amazon! ($99.97) Prices are accurate as of 23 Apr 2019 at 11:24 PM . Product Prices and availability are subject to change. Any price and availability information displayed on Amazon at the time of purchase will apply to the purchase of any products. If you are only starting to explore the world of smokers, this bullet smoker is the perfect starter kit. It’s conveniently portable with its small, compact size. It’s also very cost-effective as it uses charcoal for cooking, making it perfect for picnics, camping or road trips. 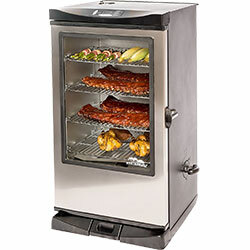 This bullet smoker features a single door with front access where the charcoal goes in, double porcelain coated racks which can fit a slab or two of ribs, and a built-in thermometer on the lid. Priced at just $50, this bullet smoker is insanely affordable and ideal for small families as well as first-time smokers who want to test the waters before going all out with top of the line smokers. A must have extra for any Masterbuilt Smoker. Attach it to your smoker and you can cook below 200F. It heats up fast, and is easy to connect and use! Brilliant! Buy it from Amazon! ($68.39) Prices are accurate as of 23 Apr 2019 at 11:24 PM . Product Prices and availability are subject to change. Any price and availability information displayed on Amazon at the time of purchase will apply to the purchase of any products. This cold smoking kit is an incredible addition to your existing Masterbuilt smoker. Simply attach this kit to your Masterbuilt smoker, and is ready to use for cooking at temperatures below 200 degrees Fahrenheit. It consistently produces smoke for a long period of time, effectively curing food and producing that delicious smoky flavor that’s hard to resist! 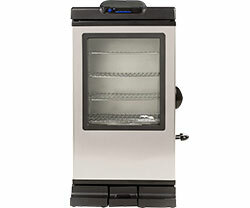 This is a must-have accessory for those who want to explore the many possibilities of their Masterbuilt smokers, letting you experiment and try different cooking styles and flavors. Imagine this scene: you’re sitting outside by your pool with a cold beer contemplating what you could have for dinner later. Suddenly, the glorious smell of smoking meat wafts over the fence from your neighbor’s yard and you envy that glorious barbecue flavor they’re going to enjoy. You make the decision on the spot. The next purchase for your yard will be a smoker! So, now you’ve made the decision to purchase a smoker, where do you begin looking? And what type of smoker would best meet your requirements? There are so many options available it really can be a minefield. Help is at hand, however! At Grills Forever we have been researching and trying out different smokers over a five-year period. I mean, what’s better than experimenting with lots of different smokers and tasting the delicious samples they produce? During this research period, we put a number of smokers to the test from all the top-quality brands that you will recognize. We realized that people are often drawn to a particular brand or are often loyal to the brands they trust. After all, if you’ve had a decent product from a company before, you are more likely to purchase from them again. That’s what brand power is all about! Consequently, we decided to list down the best products of each brand. Read on to see our findings of the Top 10 Best Masterbuilt Smokers. Whether you’re new to choosing smokers or not, it is best to do some background reading and research. With all the will in the world, a smoker is a difficult thing to purchase without the right buying guide. After all, you can’t just try one out in the store to see if they suit you. Choosing something without being able to try it is frustrating and it’s often difficult to know who you can trust. If you’re someone like me who feels these difficulties, let me convince you why our reviews won’t fail. Our methodical product research has but one purpose: to help you pick the product that is right for you. It took us over two weeks of research to arrive at our conclusion of our Top Picks and we involved several people in the process, ensuring we eliminated any subjective or biased reviews. Grills Forever reviewed all of Masterbuilt’s products before shortlisting the best 21 of them. After that, we selected the Top 10 from among them and ranked them in the order you will see below. It is worth emphasizing that we are not affiliated with Masterbuilt in any way. We’ve reviewed the Top 10 Masterbuilt Smokers due to several requests from our readers. Finally, whoever you are, if you’re looking for a smoker, this detailed Masterbuilt Smoker Review will help you. The heat is generated by burning a gas like propane or methane. Gas smokers can be used anywhere and don’t rely on having electricity nearby like electric smokers. Electricity is used to generate the heat required for smoking. You don’t need a great deal of experience to use an electric smoker. They are safer than other types of smokers (e.g. gas). They are very easy to clean and they are more energy-efficient too. These are electric smokers that come with a digital control panel. They often come with automatic heat regulators and offer an easy cooking experience that requires no supervision. Some come with remote controls and with a few models you can even use your smart device as a remote control via Bluetooth! Yes, modern technology has even entered the world of smokers! If you want to cook at a temperature of below 200˚F, you’re going to need this add-on. A Cold Kit allows you to cook at lower temperatures. You can cold smoke foods that don’t need to be cooked to give them a smoky flavor. For example, dairy products like cheese. 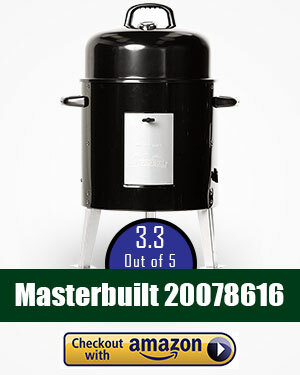 Bullet smokers like Masterbuilt 20060416 come in a cylindrical shape, with the ability to hold a larger amount of charcoal while requiring a smaller space. Smokers like these also cut the need for a smoking chimney because of some of their inbuilt characteristics. The charcoal can then be burned using fire and lighter fuel, or electricity (for the electric bullet smokers). They are an ideal way to cook slowly on low heat and keep the environment moist. It could be said that choosing a smoker is the same as choosing a car. Different people will have different needs and desires and what you want from a smoker might be completely different from your next door neighbor. You can buy a smoker from $50 upwards. If the main use of your smoker will be in your backyard, you might be best choosing a gas-fueled smoker. Gas is a reliable and easy fuel source without you having to worry about finding an outlet or an extension cable close by. Equally, you won’t have to worry about a rain shower if you’re not using electricity. If you are quite happy with using an electric smoker (and don’t fancy the hassle of changing a propane tank) then these are really easy to use especially for beginners. 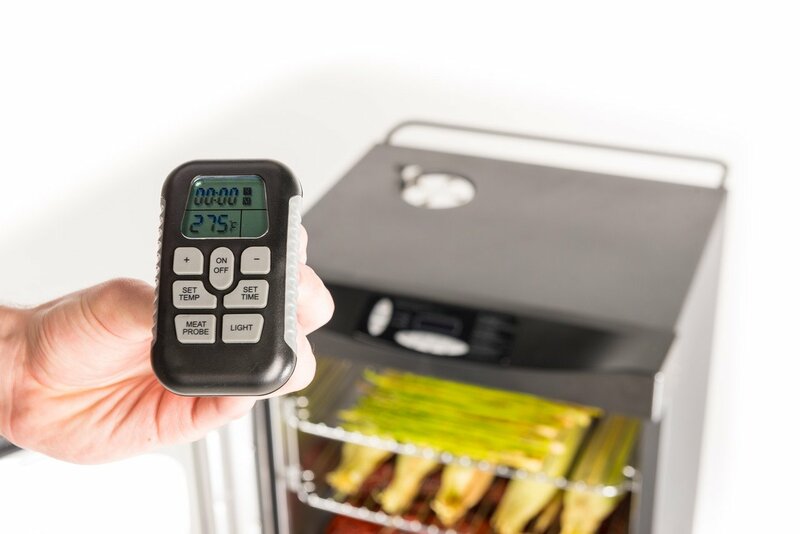 Many of them have digital controls, which mean you don’t have to babysit your smoker while cooking your dinner! If space or storage is an issue for you, you might be better with a bullet smoker. You still get the excellent smoky flavor but they take up less room without compromising cooking space. If you want to smoke and cook at lower temperatures it is also worth considering buying a Cold Smoking Kit attachment for your smoker. The only smokers that aren’t compatible with Masterbuilt’s Cold Smoking Kits are bullet smokers. So, unless you have one of these, it might be a good idea to go to the further expense of buying a cold kit. Cooking Area – as with cost, smokers come in different sizes. If you are intending to transport your smoker for camping trips your requirements will be different to someone who intends to smoke meat for a large crowd of people. Wood Chip Loader – Auto Loaders are always recommended. If your budget won’t allow it, at least make sure that the smoker comes with a good wood chip loader that slides in smoothly, you will really appreciate the convenience of being able to refill wood chips with ease. Drip Pan – Everyone knows the fun of using a smoker is in the cooking and the eating. Let’s face it, cleaning up a grill after the cooking session is such a chore. Look for a smoker that comes with a drip pan, this will certainly save you time and energy. Water Pan – Some smokers don’t come with a separate water pan and the drip tray doubles up instead. If you’re really particular about your smoking experience, it is a good idea to buy a smoker with a water pan. A separate water pan means that you use fewer wood chips, they burn for longer and therefore give you more flavor. Build Quality – As with any appliance purchase you need to look at build quality. If you live in a cooler or windier climate, your smoker will really struggle to be efficient if it is not well insulated and you might end up losing a lot of heat to the environment and thus using more fuel. It goes without saying that a well-built smoker will last a long time. If moving your smoker is one of your requirements, make sure you look at how easy it would be to transport as many don’t come with wheels or foldable legs. Choosing our Top Ten Picks was a long process. Initially, we went through over 8000 user reviews of different products to decide the important features that users need, look for and got from the products. Subsequently, we analyzed all the available Masterbuilt products that can be purchased online. After analyzing the available products, we shortlisted 20 products from the ones we researched. With these 20 products, we visited their websites, read through the product descriptions of different store pages and went through individual critic reviews to determine the features that each product typically has. With our list of 20, we did some more analysis and carried out our own product research in order to produce a side-by-side comparison of their features. To assist us in this process, we had a diverse group of volunteers who provided us with feedback on each specific model after trying them out at their homes. Once our volunteers had completed the final reviews we compared them against the research data that we had accumulated from the web. With all the data in hand, we then selected the best 10 products and were ready to present our verdict. So without further ado, here is our Masterbuilt Smoker Review and our Top Ten Picks. While choosing the best products, the Grills Forever team analyzed 34 important features that smokers can come with. These were qualities that we picked from the summary that the products display on their manuals alongside other additional features not mentioned in the manual, which are important to users when choosing a product to buy. Products were chosen with respect to smokers that will bring the best return on investment. They may not be the cheapest ones or the most expensive ones from all the products we looked at, but they are the ones with the best value for money. Finally, we considered the opinions of customers who had purchased the products to determine and exclude obsolete products from the list so that users can find an accurate review of the best Masterbuilt smokers of 2018. Before I jump into reviewing this product, let me explain to you why we have chosen this as our number one smoker. Why We Chose This as our Best Electric Smoker? When we looked at all of the products to be reviewed, we found and analyzed 34 different features. 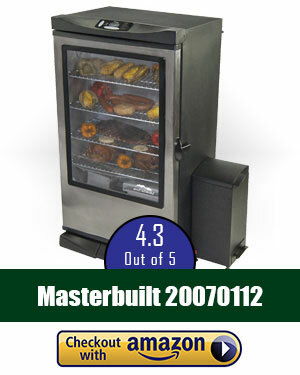 The Masterbuilt 20075315 Smoker came on top of our list as it had 18 of the most important positive features (e.g. digital control panel; remote control; meat, temperature and time sensors; just to name a few)- the highest both in the category of Electric Smokers and on the whole. Although this smoker costs around $280, you actually get a lot for your money. So, although it might seem expensive when compared to other products, when compared to other products with similar features, it is very much within the reasonable scale. At the time of research, this product had received a great average rating of 4.2. If we just looked at the user ratings, this could have placed third. However, this smoker has by far the highest number of reviews (over 4000!) and therefore achieving a higher rating from so many reviews would be much more difficult. All things considered, it still remains an excellent rating. Furthermore, with its excellent review frequency (10 reviews in less than a week consecutively), this product is the people’s favorite without a doubt. This product has a large cooking area of 975 sq. inches, which ranks it one of the highest of all the products Grills Forever reviewed. You really can cook up a feast in this one! This Masterbuilt 40-inch Electric Smoker is both suited to a complete beginner or a more-experienced smoker. The benefits of electricity mean that you can plug in, set the controls and let it do its stuff! No hassle of gas or charcoal here and it even comes with a remote control! This top-quality product has a single door with a window and internal light for viewing how cooking is coming along on its 4 chrome-coated smoking racks. It is also fully insulated with foam, meaning it is more fuel-efficient. There is an air damper on top of the unit, which you can close to retain moisture and heat. You can get cooking quickly with this product too. Assembly is really quick, with the manual stating an expected time of 25 minutes. With 975 square inches of cooking space, you can cook for the whole family (and neighborhood) with ease. It has one of the largest cooking spaces of all of the products we reviewed and can take 12 whole chickens at once – now that’s space! In terms of its physical size, this smoker measures 25 x 20.1 x 40.1 inches and comes in a professional-looking silver color. It has a maximum temperature of 475˚F. There is a smooth-operating wood chip loader as well as a front-access drip pan. Additionally, there is a removable wood chip tray and water pan. One of the best features of this product is its digital control. All you need to do is set the time and temperature and let the smoker do its job. An added bonus is the blue LED display on the control panel. This makes for easy reviewing in bright sunlight, no more squinting and changing angles to be able to read what it says! 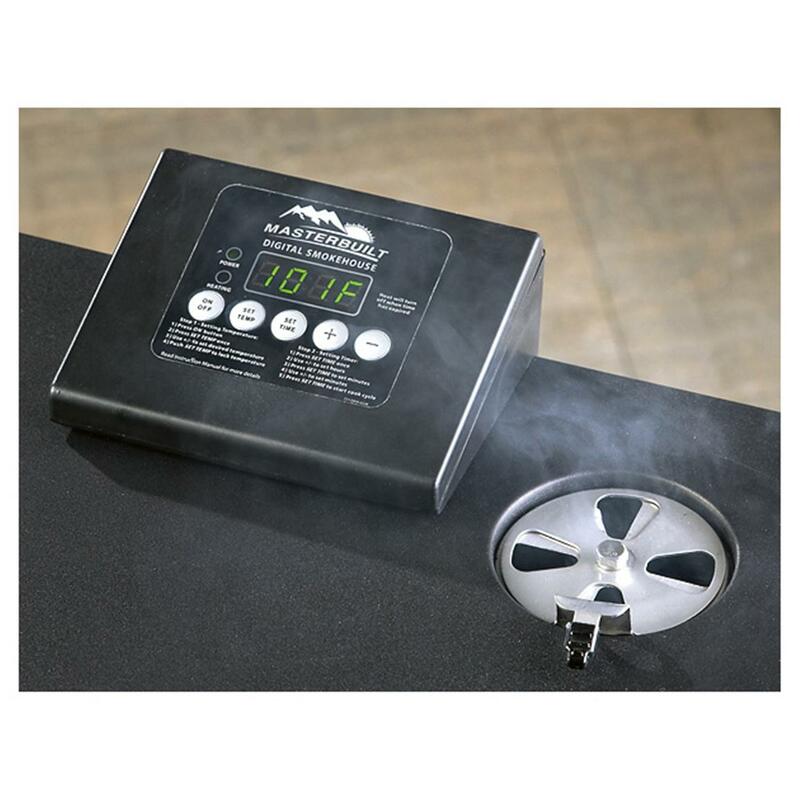 There is also a meat probe with this smoker so you can be sure that what you are serving your guests is fully cooked to the perfect temperature. The price is a reasonable $280 when you consider all that you get for your money! 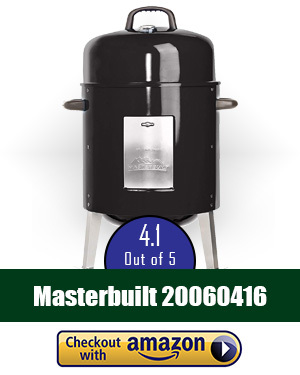 This product has been reviewed more than 4 times more than any other product in our Masterbuilt Smoker Review and it still has a great rating of 4.2 out of 5. This smoker would be an excellent choice for both a beginner and a more experienced cook. Its digital controls and remote control add a lot of value to this smoker in that you can really relax and join your family and friends with a cold beer confident in the fact that the smoker is taking care of your dinner! Why We Chose This as our Best Gas Smoker? 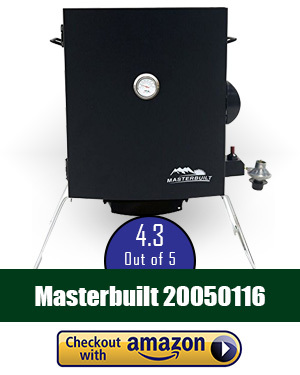 The Masterbuilt 20050614 Smoker is above all other gas smokers manufactured by Masterbuilt. 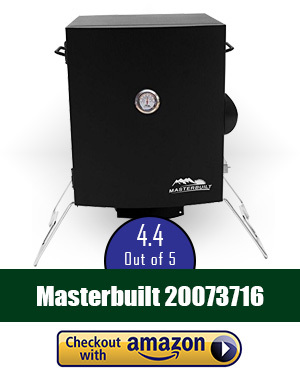 Although this smoker might seem to have less pulling power than our Top Pick, if we compare it to all of the other Masterbuilt gas smokers, this product comes with the highest User Rating. Additionally, it also has the highest number of positive features in its category and the best review frequency among its 1000+ reviews, meaning that customers who want a gas smoker are choosing this one above all others. Also, not only are they choosing it, they are happy with their purchase too. Without a doubt, this would leave all of its predecessors and other Masterbuilt Gas Smokers in the dust. It is large and easy to use and one of only 2 in our list that has more than one door to it. So, if gas is your thing, then so is this smoker! This propane gas smoker is one of only two in our Top Ten List that has a double door, one for the cooking chamber and one for the Masterbuilt wood chips. This is great because it means you don’t lose heat from cooking when you need to refill the chips. The cooking chamber also has a window so that, once again, you can keep an eye on your food without opening the door. This smoker is also fully insulated, making it even more efficient. There is also an air damper to help regulate the temperature and smoke. There are four smoking racks too, giving you ample space for your smoking experience. 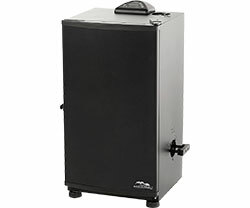 This black Masterbuilt 44-inch Gas Smoker has an extra-large capacity. 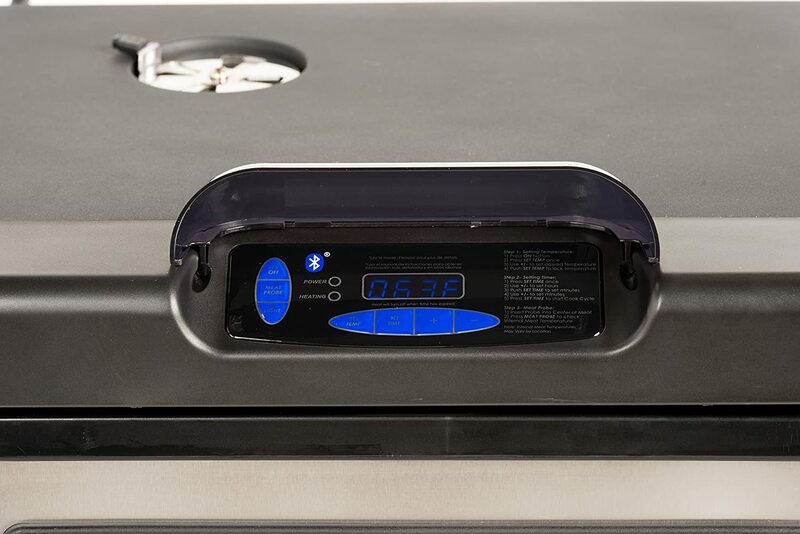 It measures 30.7 x 22.75 x 56.02 inches and the cooking space is 2000 square inches, making it the largest out of all of the products in our Masterbuilt Smoker Review and so suitable for cooking for larger crowds of people. The maximum temperature of this smoker is 350˚F. The wood chip tray and water pan are both coated with porcelain. The heat is produced by two 8250 BTU burners made from stainless steel. You can check the temperature through the thermostat at the top of the door. There is the handy push-button ignition, which allows you to start up the smoker without matches – handy if, like me, you often run out or misplace them! The wood chip loader is porcelain-coated. Although it is one of the more expensive products in our Top Ten at around $500, you really do get a lot of features for your money. If you like keeping an eye on your food whilst it is cooking, then this is the ideal product for you. Equally, if entertaining large numbers is your thing, you won’t be disappointed with the size of this smoker! Why We Chose This as our Best Bullet Smoker? Bullet Smokers, as previously mentioned, are a great alternative to a full-size smoker because they are compact but still produce a great smoky taste. Among the two Masterbuilt Bullet Smokers in our shortlisted candidates, this one comes with a higher user rating and a lower cost – which is why we’ve listed it as the best bullet smoker from Masterbuilt and it takes our 3rd place. Costing just $50, you can get your all-in-one grilling experience with this bullet smoker. The lower price is due to the fact it runs on charcoal and not electricity. However, those of you that are used to using charcoal with your traditional BBQ grill, will find this a breeze to use. Its cylindrical design means it can be ignited easily even without a smoking chimney. So, if you’re looking for a cylindrical or a bullet smoker by Masterbuilt, this is the best pick for you. As this is the only charcoal smoker in our Top Ten, it might be more popular with those of you who are used to other charcoal-fueled grills as you are confident in using that fuel source. This smoker has a single door with a double porcelain-coated smoking rack and stands firmly on its 3 legs. There are just over 395 square inches of cooking space in this smoker, making it one of the smallest in our Top Ten Picks. It is ideal for cooking for a family and measuring 19.13 x 21.65 x 31.49 inches, it is ideal for taking on camping trips. This bullet smoker has 7 features, making it the one with the fewest in our Top Ten. It is a basic smoker and is ideal as a starter smoker. At $50 dollars, this is the cheapest product in our picks but with its 4.1 out of 5 rating, people are clearly happy with its value for money. If you fancy having a go at smoking for the first time, this is an ideal starter unit more suited to cooking for smaller numbers of people. Also, if charcoal is your thing, this is the one to go for! Why We Chose This as our Best Cold Kit? As mentioned in the information above, a Cold Smoking Kit alone isn’t a smoker or a grill but an accessory to accompany any Masterbuilt Smoker (aside from the Bullet Smokers). However, due to us realizing the importance of having a Cold Kit for many people, we decided we just had to include it as one of our picks. Thus, this product is for people who already own a Masterbuilt smoker and want to increase the versatility of their cooking experiences. This cold kit easily attaches to your smoker and allows you to cook at temperatures below 200 F. This is the must-have tool for slow cookers and thus landed in our no. 4 spot. For a low price of around $60, this product can drastically improve your smoking experience. Having the second highest average rating and over 800 reviews, this product would definitely be preferable over other cold kits out in the market. If you already own a Masterbuilt smoker, this accessory is a must-have in our opinion. This cold kit is CSA Certified and has a black powder-coat design and door. It fits any Masterbuilt Digital Electric Smoker and attaches to the wood chip loader. 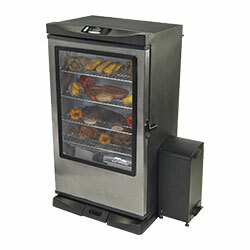 This Masterbuilt Electric Cold Smoker measures 9.8 x 8.1 x 16.8 inches. It produces smoke constantly and consistently for a long period of time. It cold smokes and cures foods at temperatures from 100˚-120˚F and is ideal for smoking foods like fish that don’t need a high temperature. It has a continuous feed. 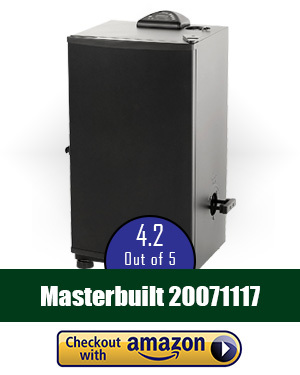 This Masterbuilt cold smoker kit has really good reviews! In fact, its average rating is higher than our top 2 picks at 4.3 out of 5. The number of reviews and review frequencies are also really good so you can be sure that people who have bought this accessory for their smoker are really happy with it. 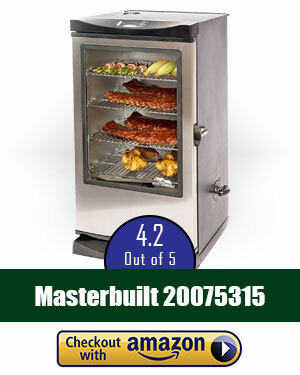 This is an excellent piece of equipment that will make your Masterbuilt Smoker even more versatile. If you are experienced in smoking and looking to purchase something that allows you to experiment with food again, this would be ideal. Equally, this is a really easy piece of equipment to use for beginners. This is an affordable, top of the range smoker. It is a real bargain, with its digital controls and super easy to use features. It is second choice because it is really great value! This product is definitely a worthy candidate for being our top pick. It’s even more affordable than our number one. But it does have fewer positive features (15 instead of the 18 that our Top Pick has); therefore it landed our Runner-Up spot. This smoker, however, is a champ in its own rights. If you’re looking for an awesome alternative at a lower price, you still won’t go wrong if you don’t choose our top pick and settle for this one instead. This one has the same average rating as our top pick and a great review frequency among the 400+ reviews. It still has most of the important features needed for a delicious smoking experience and the features that it doesn’t have in comparison to our Top Pick are more for convenience and don’t affect the cooking in any way. This Masterbuilt 30-inch Electric Smoker is another hassle-free cooking alternative. 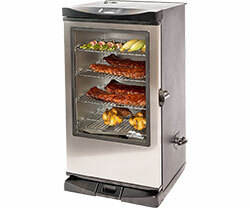 It has 4 chrome-coated smoking racks as well as an adjustable air damper to control the smoke. It also has the added bonus of a digital control panel that is used to turn it on and off, adjust the temperature and time settings. It is also fully insulated to maintain its efficiency and cut fuel consumption. 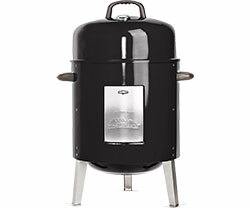 This smoker comes in black and measures in at 19.88 x 20.47 x 33.27 inches. Although it is smaller than our Top Pick, it still has enough space to cook 6 whole chickens at once! Just think of the number of BBQ ribs you can fit in too! The maximum temperature of this smoker is 275˚F, which is the same as our Top Pick. Our runner-up comes with the Masterbuilt-patented wood chip loading system, which means you can add your wood chips without having to open the door. This is a great feature as there is no heat lost when replacing wood chips! There is both a wood chip tray and a water pan with this model. Although there is no remote control, there is an integrated thermostat with digital controls on the unit. With 15 positive features, this smoker is only 3 less than our Top Pick, yet it is over $100 cheaper at around $156. It also has the same average rating as our Top Pick, and although the review numbers are considerably lower, it still has a high number of reviews and a great review frequency. A cheaper alternative to our Top Pick but with most of the excellent features as our number one, this Masterbuilt smoker is a bargain that delivers! Yes, you are missing the convenience of a remote control and a window but these don’t affect the cooking in any way. It is still an excellent product that our Grills Forever team thinks you will be happy with. If you are cooking for lots of people, this smokers large capacity will really please you. It also has some super high-tech features and controls that will get you excited! If you’re fed up with heavy lifting when you want to move your smoker, you’ll find this smoker a breeze to maneuver. This 30-inch smoker is the only one in our Masterbuilt Smoker Review to have a rear handle and wheels! Inside this electric smoker are four chrome-coated smoking racks, large enough to cook 12 whole chickens or 80lbs worth of food! There is a top air damper to allow you to control the smoke. 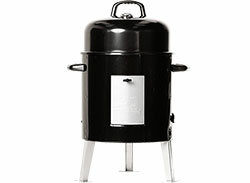 This smoker also has a different look to it than most of the other smokers; it is black with a stainless-steel door. The door also has a window. This large smoker measures 20 x 20.1 x 34.4 inches and has 721 square inches of cooking space – enough to invite all of your neighbors for a party! The 800-watt heating element allows you to cook up to 275˚F. This smoker uses Masterbuilt’s patented side wood chip loading system, meaning you can add your wood chips without opening the smoker door. 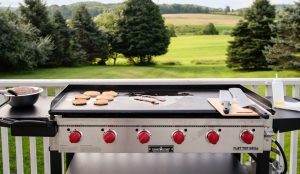 The wood chip tray, drip pan and water pan are all removable, and there is a grease pan that you can get access to from the front, meaning that you can clean the smoker really easily. For all you tech lovers out there, you will love the features that this smoker comes with! Not only can it be operated digitally, but you can control it from your hand-held device via Bluetooth. Your cell phone or tablet becomes the remote control, allowing you to turn it on and off, check and control the cooking time and temperature, turn on the inside LED lighting and check the temperature inside the meat! It really is a fantastic feature. You can sit back and relax with a cool beer and still be in control of the cooking. What’s not to love? The digital control panel uses blue LEDs and has a sunshade that is removable so even when in bright conditions, you will still be able to see what it says. This smoker has 17 positive features, which is only 1 less than our Top Pick. It costs around $260 and is quite popular as seen by the number of reviews and review frequency. The average rating is 4 out of 5, meaning that customers are happy with this product and feel it is value for money. If cooking for large crowds and being up to date with the latest technology are your thing then look no further! You won’t be tied to the smoker with its smart Bluetooth controls and can still enjoy being a great host to your guests. This smoker is the one for you if you want to take it places with you on trips. It is perfect for moving around, but does sacrifice size and is only good at smoking for small groups. Do you want a portable electric smoker? This simple smoker is ideal! It has legs that fold easily underneath the smoker meaning you can put this in your trunk and take it with you! The controls are really simple on this smoker and you can set it to low, medium and high. The temperature gauge is on the door and is really easy to read. Behind its single door, you will find to chrome-coated smoking racks. 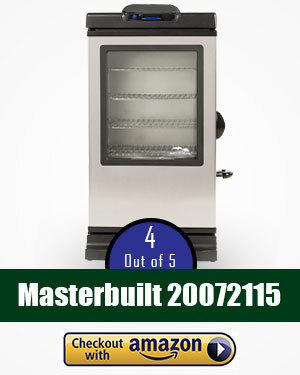 The Masterbuilt 20073716 Electric Smoker measures in at 15.94 x 23.62 x 23.42 inches and comes in black. It has a 1400 watt heating element that can reach a maximum temperature of 275˚F. It is a perfect size for cooking a burger or steak for a family of 4. Among the 11 positive features this smoker has, you will find a removable wood chip tray and water pan. 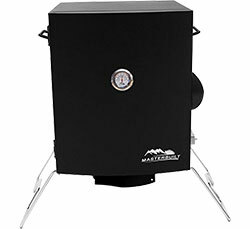 At just under $175 dollars, Masterbuilt 20073716 is one of the more-reasonably priced smokers in terms of value for money. Reviewers love this product and it has the highest average rating of all of the products in our Masterbuilt Smoker Review at 4.4 out of 5. The review frequency is also good meaning that not only are people choosing this product often, but they are happy with their purchase too. 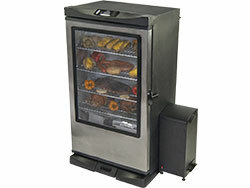 This smoker is ideal for those of you who want to transport your smoker outside the home on camping trips or road trips. If you want something that is simple and easy to use, this one is perfect. This smoker comes with everything you need, if you new to smoking or are a seasoned smoker. It is a little more expensive, but has a big capacity so you can cook a lot at once. 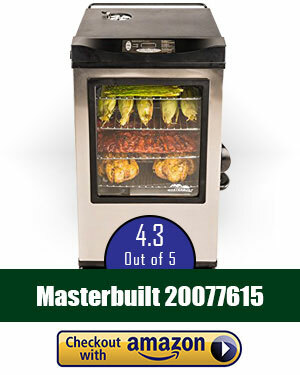 Our number 8 pick is the Masterbuilt 20077615 Electric Smoker. Its digital controls make it simple and easy to use and so is, therefore, suitable to both a beginner and a pro! It has a single door with a window and 4 chrome-coated smoking racks inside. This smoker has a maximum temperature of 275˚F and a large cooking space of 721 square inches. It measures 19.7 x 20.3 x 32.1 inches. It comes in stainless steel with a black trim. The 800-watt heating element heats up to an even and consistent temperature. Its wood chip loader is smooth-operating and you can access the drip pan from the front, making it really easy to use and clean. What makes this a really good purchase is its remote control operation. With the remote control, you can monitor the temperature and the cooking time as well as measuring the internal meat temperature with its built-in meat probe. Also, the remote control allows you to operate the internal lighting as well as turning the whole thing on and off. The display itself uses blue LEDs to make it easier to read in direct sunlight. Finally, this smoker is unique in that it comes with both a cover and a recipe CD so you can start cooking without any experience. At around $539, the Masterbuilt 20077615 Electric Smoker is the most expensive in our Masterbuilt Smoker Review. Price aside, this product has an average rating of 4.3 from across 162 reviews at the time of research. Given that the review frequencies are also good, it is clear to see that customers are prepared to spend the higher amount of money and are happy with their purchase. Whether you’re a seasoned pro at smoking or a complete beginner, you’re sure to be happy with your purchase of this smoker. It is easy to use with its remote control and recipe CD but also produces great results! If you want to avoid fussing around with gas or charcoal, then this electric powered pick could be for you. It is easy to clean, a good price and smokes well. If it’s a bullet smoker you’re interested in but prefer the use of electric, this one is for you. This steel smoker incorporates 2 porcelain-coated smoking racks. There is a really useful hook on the side of the smoker, which you can use for hanging the lid whilst you add your meat. You can control the smoke and moisture with the adjustable air damper. There is a 1650 watt heating element inside this smoker, which allows it to produce consistent smoking up to 400˚F. There are 395 square inches of cooking space making it the smallest capacity in our Top Ten picks, however, it can still cook a big bird or brisket or up to 50lbs of meat. This smoker is really lightweight, just weighing around 17.5lbs approximately making it really portable. It measures a tidy 31.49 x 25.39 x 19.13 inches and therefore is incredibly compact. The lid has a temperature gauge in the lid that is really easy to read. It comes ready with a removable drip tray, wood chip pan and water pan that are also porcelain-coated. This is the second cheapest smoker in our Masterbuilt Smokers Review at an affordable $83 dollars meaning it is a really good entry-level smoker for you and your family. Despite its reasonable price and 8 positive features, this product was bumped down our Top 10 due to its average review score of 3.3 out of 5 at the time of research. It does, however, have a good review frequency so people are still choosing to buy this smoker. Want a smoker that is really portable and without the fuss of charcoal and propane? Here’s your product! Simple yet effective, this bullet smoker does exactly what you need it to. If you want to try out smoking food for the first time, then this is a good smoker for you. It is easy to put together and really portable, but be warned the 1lb propane canister won’t last long. Gas is often favored by campers and road trippers since canisters are so easy to come by! 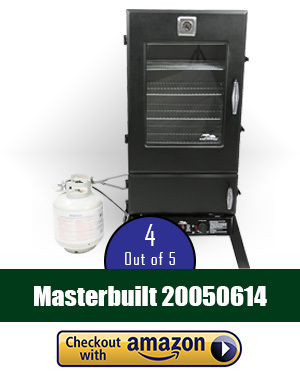 The Masterbuilt 20050116 is a portable gas smoker that is ideal for camping trips. 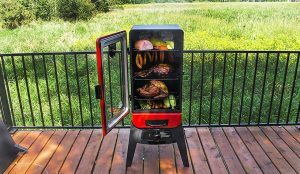 It is similar to our number 7 pick in that its legs fold easily underneath for transportation, however, with this smoker you don’t need to worry about having electrical hook up and your trips can be really remote! It is well-built with a single door and comes with 2 smoking racks. This smoker uses a 1lb propane cylinder. If you intend to cook for longer periods of time you can buy an adapter for a 20lb cylinder too. This portable gas smoker measures 15.91 x 23.62 x 23.15 inches. Inside you could probably smoke a 10 to 12lb turkey if you removed the top rack, so it is certainly big enough to provide food for a family. The maximum temperature of the Masterbuilt 20050116 is 275˚F. There is an easy-to-read temperature gauge on the door so you can keep an eye on the temperature and adjust as necessary. It comes with a removable wood chip pan and water pan. The burner is made from stainless steel and has a 5000 BTU output. 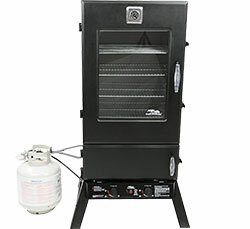 This is one of the cheapest models of smoker in our Top Ten Masterbuilt Smoker Review at a price of just under $80. The average rating for it is 4.3 out of 5 and, whilst its review frequency isn’t as great as many others in our picks, 60% of reviews are 5 star. If you’re used to using propane for your grill and want to try something new, this is an ideal entry-level item for beginning your love of smoking food. If you find that a 1lb propane canister doesn’t last long, don’t forget you can always buy a 20lb adapter meaning you can smoke for longer without having to change the canister. It is important that whilst enjoying your smoker that you follow some simple guidelines to ensure that you are using it safely and correctly. Smokers are for outdoor use only and this means that you shouldn’t be within 10 feet of a building or structure. Additionally, you shouldn’t use your smoker in a covered area like a garage or a porch. 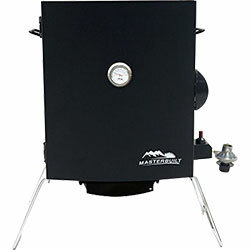 Masterbuilt smokers are designed to use wood chips only so, although you might see people in reviews saying they used chunks, it is important to know that the products are not designed for this. Don’t leave it until you want to cook before assembling and getting your smoker ready as you might be in for a long wait! Before using a smoker, it needs to be pre-seasoned. This means you need to let the unit run at 275˚F for three hours without any water in the water pan. For the last 45 minutes, you should add half a cup of wood chips to the wood chip pan to complete the process. The smoker should then be turned off and allowed to cool completely. Now it is ready to use! The beauty of a smoker is that you can experiment with different flavors. There are so many different choices of wood chips. The most commonly used are hickory and oak but you can even find maple, pecan and mesquite wood chips. Who would have thought there was so much to consider when purchasing a smoker? You’ve now read our Top 10 Masterbuilt Smokers Review and hopefully feel a bit more informed about the choices and features available to you. Whether it’s charcoal, gas or electric you’re looking at, I hope you’ve learned enough about the products to make an informed choice and have decided what is an absolute must-have for you in your purchase. Whether you’re coming to smoking as a new alternative to your basic pellet grill or whether you’re a seasoned pro, there is so much to consider! It is worth doing your own bit of research to gauge what consumers are saying but it is important to be aware that some reviews may be biased in opinion. If you’re still struggling to make a choice, our Top Pick is always a winner. Our aim at Grills Forever is to help you find what you’re looking for and we hope we’ve done that today!